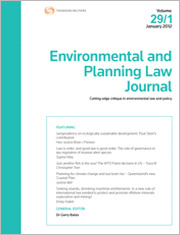 This article explores the impacts of climate change for environmental impact assessment (EIA) law – the law that regulates decision-making on projects and activities likely to have significant environmental impacts. In serving as the mechanism for arbitrating which potentially harmful projects and activities are approved, and on what conditions, EIA law has the capacity to play a role in regulating climate change. Climate change, in turn, has a capacity to impact upon EIA law. First, as the imperative to take action on climate change increases in urgency, and as more rigorous policy responses emerge, the traditional energy projects landscape which, in Australia, is centred around coal production, will start to make way for a different matrix of projects, including unconventional gas and renewables. These types of projects present a ripe opportunity to more effectively utilise the principles of ecologically sustainable development (ESD), codified in Australia’s federal EIA legislation, in decision-making. Failure to do so may hinder Australia’s ability to implement an environmentally, socially and economically successful climate response. Second, climate change, being a model exemplar of the tendency for environmental impacts to materialise as a result of cumulative influences, will challenge the EIA law system’s ability to deal with impacts that are ultimately the result of system resilience being degraded in a cumulative fashion over potentially broad spatial and temporal scales, thus where an impact’s causal linkage is non-exclusive to a particular proposal. In framing EIA law as a decision-making system, this article investigates each of these challenges and EIA law’s capacity to respond – which will be necessary for the advancement of Australia’s contribution to climate goals. This article argues that there is considerable merit in the introduction of a general duty of care for the environment in jurisdictions which have not so far embraced this concept. As with work health and safety legislation, such a duty would establish the broad goals of the law, providing unifying themes that clarify the intentions of the law. A particular virtue is its all-encompassing character: providing a broad standard of care that can be applied to fit any set of facts. As such, it would provide a valuable framework within which duty-holders must operate, which will be particularly important where no more practical guidance is available from other sources. The broad scope of the duty also means that it does not date quickly and that it provides considerable flexibility for the duty-holder to determine the action to take to suit their operations. The South Australian experience shows that a duty of care, if fully embraced by the regulator, can be an important component of the regulatory toolkit. However, other Australian jurisdictions provide for a more limited (and so less controversial) form of the general duty, in which it operates primarily as a defence, and where the remedies for breach are administrative, not criminal. This article argues that there is a case for going one step further and imposing criminal liability, a proposal that is being contemplated in Victoria at the time of writing. Regulation that purports to address sustainability in natural resource management often fails to deliver sustainability, or even meaningful conservation of the natural resource. This is partly due to the absence of clearly defined sustainability goals, and the means to measure the application of steps to reach these goals. This article seeks to address this gap with respect to public forest harvesting in Victoria. By aligning regulatory theory with regulatory instruments designed to address sustainability in harvesting in State forests, a new form of sustainability regulation is discussed, enabling efficient measuring and monitoring of the progress toward particular sustainability objectives. Examples of actual clauses are given to provide practical examples, demonstrating meaningful sustainability regulation. This article explores the first 20 years of performance-based planning in Queensland, how it has evolved and what it means for the interpretation of planning schemes. It describes how, over the past 20 years, planning law has become significantly more discretionary, whether or not that was the intention of the original drafters of the Integrated Planning Act 1997 (Qld) and whether or not that is the inevitable result of a system based on performance-based planning. It demonstrates this thesis with some case examples of discretionary, performance-based decision-making in practice. It also considers the role the sufficient grounds test has played in the evolution of this more discretionary system. It identifies the advantages and disadvantages of a highly discretionary, planning and development control regime. Overall, it argues that, more so than any of the procedural reforms to planning law, it is the evolution of PBP that has played into the hands of developers who wish to prioritise economic development over and above other planning goals. Forest fires are responsible for forest degradation and are one of the most direct causes of greenhouse gas (GHG) emissions. The REDD+ initiative is considered to be a partial solution in reducing forest fires by incentivising behaviour which prevents further deforestation and degradation. In Indonesia, this mechanism may provide a significant driver for law reform and policy change to reduce forest fires. This article examines the legal and policy frameworks in Indonesia to implement and integrate REDD+ into forest fire reduction strategies. It examines the international framework of REDD+, the moratorium on forest and peatland concessions and presents a case study of the first REDD+ pilot project in Central Kalimantan. The article evaluates these initiatives and their outcomes. It then considers a number of recent strategies which Indonesia has adopted to strengthen forest and peatland protection. For the PDF version of the table of contents, click here: EPLJ Vol 34 No 3 Contents.